What's he going to do next? It's that time of year again. Time to regroup and get back on track, because if you are like me, you've fallen off the writing wagon. (enough cliches for you?) I am not very disciplined and can easily be led astray by Christmas shopping, decorating, watching old movies, eating cookies, napping.... And I'm just now trying to get back to the projects that I left behind two weeks ago, namely, revisions for a Thomas Jefferson biography. My major job, according to my editor, is to rethink the structure and clarify the theme. 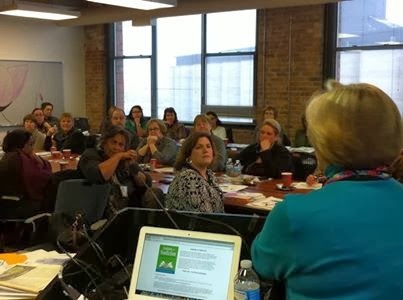 She said, "You want your reader to ask, "What's he going to do next?"" A great question for anyone who is writing a biography. What she means is that each scene has to be dynamic and build to the next one. Keep the action moving. That can be difficult when TJ basically instructed everyone else into action. And a picture book would be pretty boring showing TJ at his writing desk page, after page, after page. So, I have a lot of thinking to do. Here's to you and to writing in the New Year! 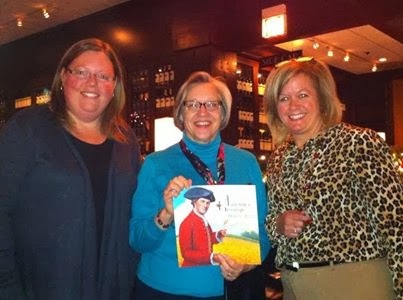 I spent this last weekend at the Illinois Farm Bureau's conference in Chicago, and had a nano-taste of what a rock star must feel like. I never met so many people who had 1. heard of one of my books, and 2. wanted me to sign them. I actually had a line!!! This adulation was all thanks to one of the best PR guys I have ever met -- Kevin Daugherty -- and his staff at Illinois Ag in the Classroom. I gave a presentation to classroom teachers and Ag in the Classroom folks, who help teachers incorporate agriculture into their lessons. 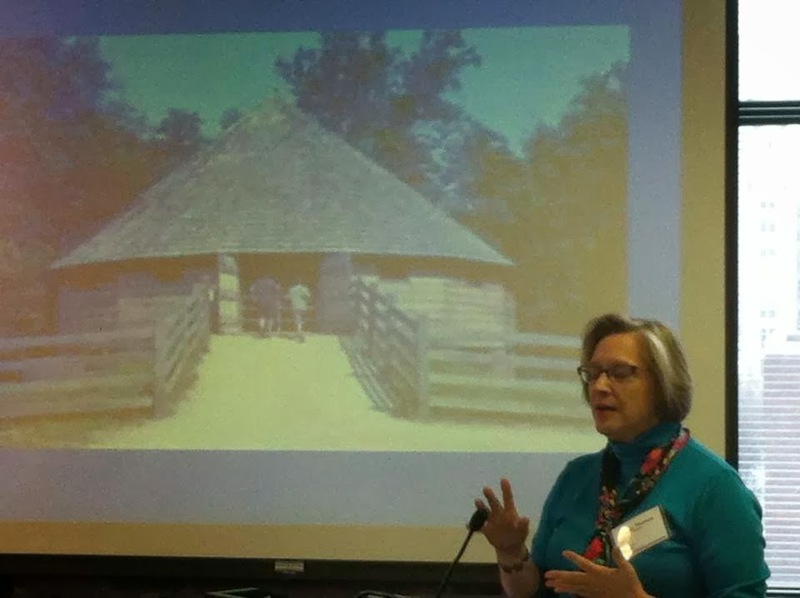 I spoke about how I came to write Farmer George (a family vacation trip to Mount Vernon), how I wrote it (over many revisions) and how it almost didn't fill the requirements of an "Ag book" (depicting agriculture accurately) because I had written "pushed the plow" (you guide the plow while an oxen pulls it). I was just the warm up act. After the break, Kevin then showed how Farmer George can start a discussion about seeds, soil, compost, and horses with simple activities and additional materials from their magazines. Kevin even got the rarely-sighted man in the audience to make a Soil Sam by filling a knee-high stocking (non-reinforced!) with grass seed and soil. 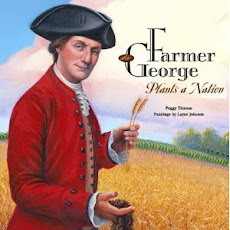 Anyone interested in these activities can access a PDF of the booklet here: http://www.agintheclassroom.org/TeacherResources/Lesson%20Booklets/Farmer%20George%20Plants%20a%20Nation%20Lessons.pdf It gives directions to make Soil Sam, as well as several lessons on trees, horses, and my favorite, milling wheat. 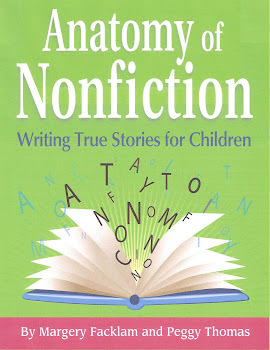 And I've added additional lesson ideas (not ag related) on my website http://www.peggythomaswrites.com/Teacher-s-Guides.html.